Spice up your tracks with models of vintage mics from Neumann, Coles and others plus modern boutique microphones. Antares' patented Spectral Shaping Tool technology gives you precise digital models of over 100 legendary microphones. Simply tell Mic Mod EFX what microphone you are actually using and what microphone you'd like it to sound like. Not only do Mic Mod EFX's models reproduce all of the subtle sonic characteristics that make each microphone unique, but they also give you control of each mic's specific options. Does the mic have a low cut filter? If so, it's in the model. Wind screen on or off? Close or far placement? Each option results in the same sonic effect that it would have with the actual mic. For that final touch of perfection, you can even add some tasty tube saturation. Mic Mod EFX gives you a huge virtual microphone collection that you can use for recording, mixing and even in live performance to get the sound of mics you would never consider using on stage. It's also a great tool for broadcast and podcasting applications. Simply select the mic you're using (or used during your original recording) and the mic you want it to sound like. Proximity Effect is a bass boost that results from placing a directional mic in close proximity to a signal source (e.g., a singer's lips). With Mic Mod EFX's Proximity controls, you can actually create the effects of different mic distances based on the specific physical properties of each individual modeled mic. If your source mic has a low cut filter, enter its setting in the Source Mic Low Cut menu. If your selected modeled mic has a low cut filter, you can model the effects of any of its settings with the Modeled Mic Low Cut menu. If your source mic has variable pickup patterns, enter the selected pattern in the Source Mic Pattern menu. If your selected modeled mic has variable pickup patterns, you can experiment with the effects of any of its patterns with the Modeled Mic Pattern menu. Based on the same technology as Antares' famed WARM Tube Saturation Generator, the Tube Saturation control lets you give your track the warmth of a high-quality tube pre-amp. 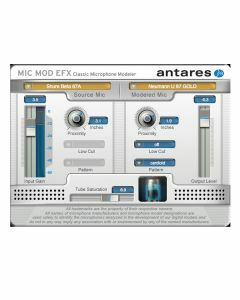 Mic Mod EFX requires an iLok (not included). Pro Tools 10.3.8 or later. Mac OS 10.9.5 to 10.13 as required by your version of Pro Tools. A compatible VST host program that supports the VST3 format. Mac OS 10.9.5 to 10.13 as required by your host. A compatible host program that supports the Audio Units format. Pro Tools 7.x to 10.x. Mac OS 10.5.8 to 10.9.5 as required by your version of Pro Tools. Windows 7 to 10 as required by your version of Pro Tools . A compatible host program that supports the VST2 or VST3 format. Windows XP, Vista, 7, 8, or 8.1 as required by your version of Pro Tools.